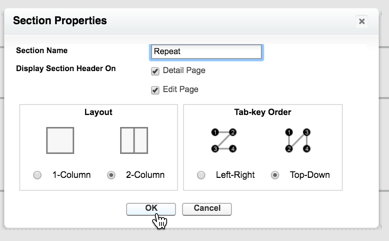 Don’t see Repeat Tasks on the Page Layout? Repeat Tasks is a feature available in Summer ‘18 - versions 13.27 and above. If you started using Taskfeed before July 2018, ask your Salesforce Administrator to customize the Taskfeed Task Page Layout with the Repeat Task fields. Adding Repeat Task fields to the Taskfeed Task Page Layout. Go to the Object Manager in Salesforce Setup and select Taskfeed Task. Select Page Layouts and open the Taskfeed Task Layout. Drag and drop and new Section from the Palette onto any area of the page. We suggest below the Schedule section. Enter Repeat for the Section Name. Repeated Task and Repeated Occurrences should be Read-Only. Click the wrench icon next to Repeated Task and Repeated Occurrences and mark them as Read-Only. Click Save to save and exit the page layout editor.